Sometimes there’s nothing as tasty as a good cozy mystery, and two recent food-themed titles offer some juicy plots for armchair sleuths to chew on. The hamlet of Cloverdale seems to have taken a shine to newly transplanted resident Piper Lamb and the homemade concoctions she sells in her shop, Piper’s Picklings. But then “The Pickled Piper,” aka the town bully, is found dead in Piper Lamb’s pickle barrel, and suspicion falls instantly on her assistant’s bohemian boyfriend. 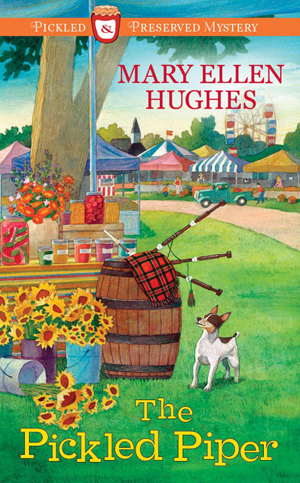 Piper and her neighbors throw themselves into playing detective, trying to clear his name, but as more townspeople are murdered and attacks of vandalism against Piper herself begin to escalate, she begins to fear that she may be the villain’s next target. 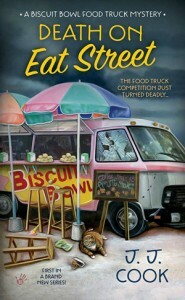 In “Death on Eat Street,” Zoe Chase finally has taken a giant leap toward her dream of opening her own restaurant, despite the disapproval of her posh parents and sexist ex. For now it’s just a dingy diner and a rickety food truck, but she’s beginning to make a name in the community with her inventive and addictive biscuit bowls. But when her biggest rival is found murdered in her truck, Zoe finds herself at the center of a tangled criminal investigation involving everyone from a celebrity chef to a former president. Although one novel is set in a small upstate New York town and the other in the streets of urban Alabama, both of these books are chock full of the spice, salt and interconnectedness of community life, both for good and for bad. Each also centers around a woman trying to reinvent her life in a culinary venture — and the inclusion of recipes in both is an especially delicious perk.